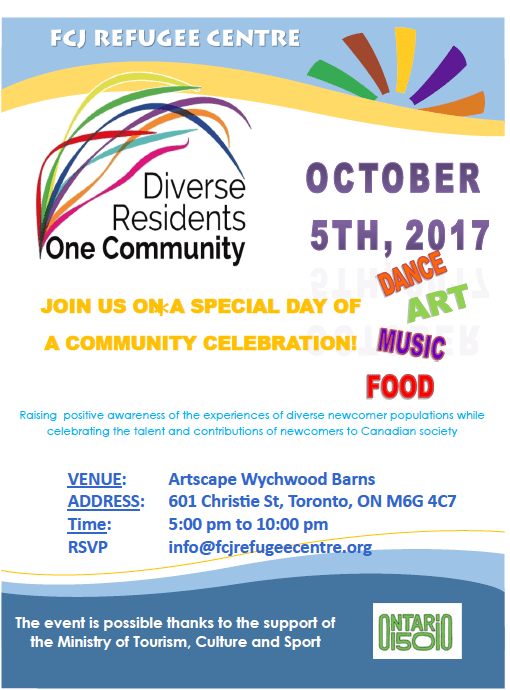 The FCJ Refugee centre is inviting you to the Diverse Residents One Community Celebration, a great festival that will raise positive awareness of the experiences of diverse newcomer populations while celebrating the talent and contributions of newcomers to Canadian society. You can find a fest of delicious foods from different countries all around the world: Tacos, pupusas, samosas, gateau (Guinea fish cakes), Barbados coconut bread, Salvadorian quesadillas, etc. There will be free workshops on Henna body art, jewellery, etc. Also, you can find indigenous crafts, jewellery made from women in our houses, handmade souvenirs, and other crafts made by newcomers. The initiative will engage around 100 of participants. Get inspired and connect with others. You are welcome to sign up and make new friends! It will take place at Wychwood Barns, 601 Christie Street in Toronto, ON. On October 5th, 2017, from 5:00 pm to 11:00 pm.